• Gases give off heat when changed from gas to liquid. For an air conditioning system to operate with economy, the refrigerant must be used repeatedly. For this reason, all air conditioners use the same cycle of compression, condensation, expansion, and evaporation in a closed circuit. The same refrigerant is used to move the heat from one area, to cool this area, and to expel this heat in another area. • The refrigerant comes into the compressor as a low-pressure gas, it is compressed and then moves out of the compressor as a high-pressure gas. • The gas then flows to the condenser. Here the gas condenses to a liquid, and gives off its heat to the outside air. • The liquid then moves to the expansion valve under high pressure. This valve restricts the flow of the fluid, and lowers its pressure as it leaves the expansion valve. • The low-pressure liquid then moves to the evaporator, where heat from the inside air is absorbed and changes it from a liquid to a gas. 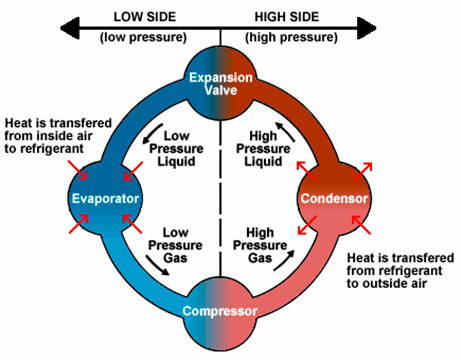 • As a hot low-pressure gas, the refrigerant moves to the compressor where the entire cycle is repeated. Note that the four-part cycle is divided at the center into a high side and a low side. This refers to the pressures of the refrigerant in each side of the system.